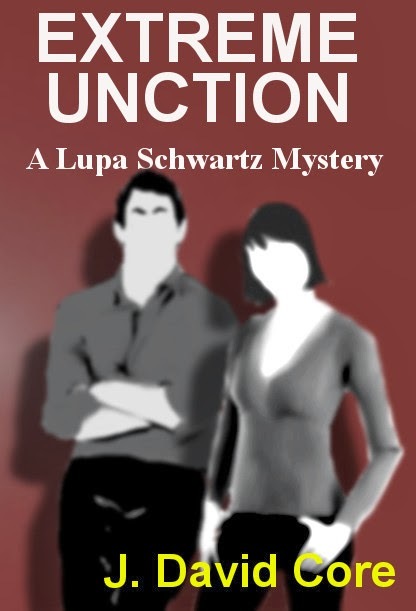 When an autopsy finds traces of the banned insecticide Chlordane in the anointing oil on the corpse of a local big-wig, Pittsburgh police bring Lupa Schwartz, an outspoken non-believer, into an investigation focused on a well-liked local clergyman. Worried that the police are planning to use him as a political fall-guy, Schwartz coerces Cattleya Hoskin, a magazine reporter with a connection to his family’s past, to chronicle his process and squelch any misgiving that his world-view influenced the outcome. Suspicion in the case is focused on Fr. Coneely, an outspoken euthanasia advocate who had earlier made the mistake of telling the family of the now-dead man that, hypothetically, he could safely apply poison-laden oil to their suffering father during last rites, and nobody need be the wiser. Was Mr. Hanson the willing victim of a mercy killing, or was a lapsing insurance policy the real motive for one of Hanson’s five children to taint the oil? The following passage was a challenge because I had to write in two distinct voices simultaneously. The narrator of my novel, Extreme Unction, is Cat Hoskin. She had invited Clement Foyer to attend and review a concert featuring the blues band her current love-interest (a Pittsburgh police detective in the homicide division) plays horn for, and the metal band his son fronts. The next day, she nervously avoids reading the review, until she can put it off no longer. Finally, my resolve set in, and I began reading Foyer's review. It began respectfully enough. Saturday night in Oakland is never dull, and this past Saturday was not the exception to prove the rule. I attended a unique show at the Century Club at the invitation of a fellow journalist. "Okay," I thought, "this was readable." So I continued. She assured me that any misgivings I might have had about the theme of the show, sort of a father/son night at the frat house, would be thrown off the minute the first of the two bands began to play. She wasn't far from wrong. The band that opened the show is called Humpback and the Blues Whailers, and they're made up of some of Pittsburgh's finest, and yes, they are a blues band. I have to tell you that for a bunch of old boys-in-blue playing a bunch of good-ol'-boy blues, they're pretty darned good. Now I know what you're thinking. Foyer — you're thinking — you're making this review extra lenient in lieu of making a contribution to the Policeman's Benevolent Fund this year. To this I say read on. The band began their program by mocking the very kinds of bands they claim to admire with a Blues Brothers’ opening complete with synchronized horn section choreography and synthesized organ chords. As nostalgia, there's nothing wrong with that in itself, but an audience has to be able to hearken back farther than last month in order to appreciate what they're being asked to hearken to. About this time, I was wondering if I'd maybe missed something in the business section that I could turn to rather than continue. But, never let it be said that a Hoskin couldn't take the heat. I forged on. The audience of gen-X metal fans — who had really come to hear the main attraction, FdP — sat in stunned silence as Humpback drove their father's Oldsmobiles through a number of ol'-timey saws that might as well have included "King of The Road" and "Sweet Adeline" for all of the recognition it sparked. Then the magic happened. Inspiration had come to some one of the show's architects in the form of a cross-over number, with FdP's excellent guitarist, Mack "Daddy" Dinini sitting in on one of the blues tunes. For two paragraphs, Foyer told the saga of the dim lights and the searching spotlight that had finally revealed Dinini standing in the wings. Two more paragraphs were expended relaying the tale of the following number, and singing the praises of Jason's voice. Little mention was made of Jimmy's virtuoso performance, and absolutely no mention was made of Penelope's capably crafted vocalizations. I felt terrible. With a profound interest in religion, liberal politics and humor, Dave began writing in High School and has not given up on it since. His first professional writing jobs came while attending the Art Institute of Pittsburgh when he was hired to create political cartoons for the Pitt News & to write humor pieces for Smile Magazine. 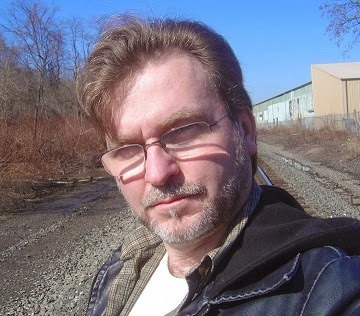 Dave has worked in the newspaper industry as a photographer, in the online publishing industry as a weekly contributor to Streetmail.com, and was a contributing writer to the Buzz On series of informational books and to the Western online anthology, Elbow Creek. Dave’s science fiction novel, Synthetic Blood and Mixed Emotions, is available from writewordsinc.com. Dave currently resides in his childhood home in Toronto, OH with his beautiful girlfriend and his teenage daughter. He enjoys participating in local community events & visiting with his two adult children and his grandson.